Stringing together sentences using the miniaturised and virtualised keyboard of a smartphone slows us down. Two fingertips just aren’t as fast as ten. Trying to type on these devices as quickly as we think — or as fast as someone can speak — can be unproductive and frustrating. And we must learn a different type of keyboard with each device. The keyboard on a Samsung tablet is different to that of a Sony smartphone, and they are based on the same operating system. It gets worse when jumping across an operating system divide..
Microsoft has a solution to this quandary. Its Universal Foldable Keyboard is a full-sized keyboard that folds in half, is resistant to spills and has a quoted battery life of three months. The keyboard itself is no wider than the microUSB port tapered onto its end. True to its moniker, it folds right down the middle, like an oversized European wallet. Powering it on is a matter of opening the keyboard. Shutting it down is easy as folding it close. 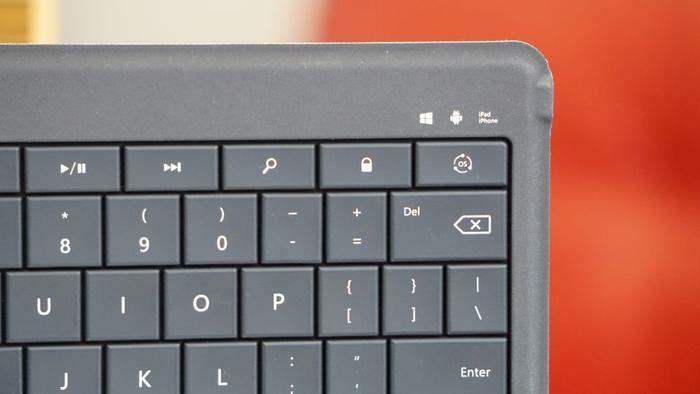 Parts of its design have been lifted from the keyboard cover made for Microsoft’s Surface. Large keys sit comfortably in a fabric-like material. Numerical keys sit above the QWERTY arrangement, and above them are controls for volume, music playback and search. Other buttons allude to this keyboard’s support for different operating systems. It will communicate with smartphones and tablets running Apple’s iOS, Google’s Android and Microsoft’s Windows. Two buttons labelled with the Bluetooth symbol up top make it possible to alternate between two devices during a single typing session. The keyboard communicates with smartphones, tablets and hybrids over low energy Bluetooth 4.0. Pairing involves holding down one of the abovementioned Bluetooth buttons, finding the Universal Fold Keyboard and using the keyboard to enter the pairing code. An OS button on the keyboard’s top-left toggles between the supported operating systems. The keyboard works best when it is used with one device. The keys are large, supple and are characterised by plenty of travel, so that the fingers of brash typists aren’t absorbing the shock. The keys themselves are grouped into two, one for each hand, due to the material hinge that enables it to fold in half. A slight learning curve is needed to get used to the layout, but after an afternoon, typing on the Universal Foldable Keyboard becomes second nature. Switching between two devices within a single session happens mostly without fuss. Alternating between Microsoft’s Surface Pro 4 and Apple’s iPhone 6s Plus was a seamless affair. Each device maintained a connection over Bluetooth and practically recognised keystrokes immediately. Some trouble was encountered with devices operating on Android. 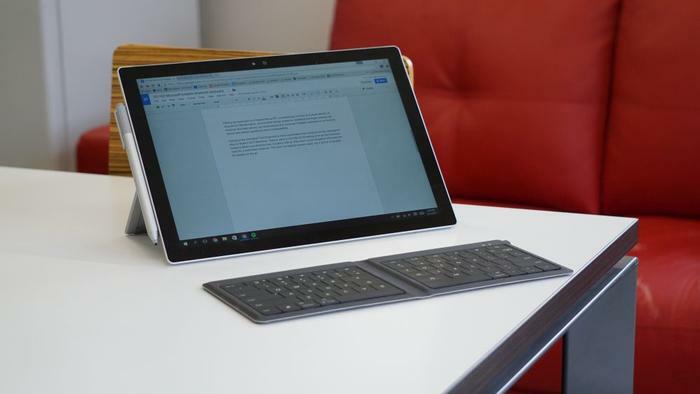 The keyboard would pair with a Samsung Galaxy Tab S2, only it would drop the connection as soon as we switched to the Surface Pro 4. Pairing the keyboard to a Huawei Nexus 6P — a smartphone running a stock version of Android 6.0 Marshmallow — encountered similar problems. Disabling the finger scanner lock screen did minimise the interruptions, but reconnecting the Universal Foldable Keyboard to an Android device was always spoiled by some incompatibility. Typing on the Universal Fold Keyboard is more comfortable than doing so on the redesigned keys of Apple’s 2015 Macbook. There’s value in the high $129 asking price as it turns a tablet into a productivity tool. Couple it with an iPad and it could altogether eliminate the need for a dedicated notebook. 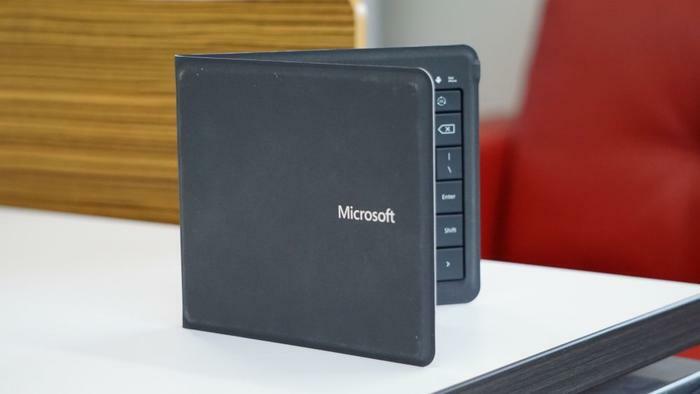 This won’t be ideal for power users, but for people on the go, it will be invaluable.